Type in your words or phrases, and as you type your message is placed into code. The students use the chart at the bottom of the page to decode your words or phrases. Great for an "on task" activity when students come in the room. 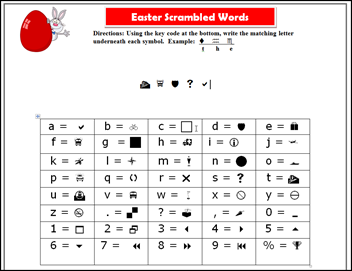 This scrambled words game is themed for Easter. Be sure to read instructions before use. 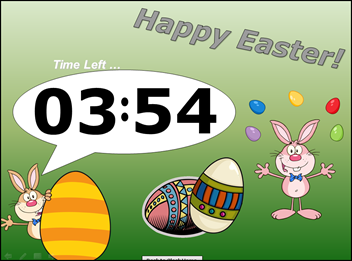 This is a very simple Easter themed PowerPoint timer that you can use in your classroom or training. As a teacher or trainer there is no longer any need to wonder where the minute or second hand was when you told your students they had 5 minutes. You can use this timer immediately. This timer is a good basic clock that can countdown almost any time from one hour down. Simply open it, start the PowerPoint show and click on the time to start. That's right just input all your words or numbers into the cells and hit print. Then click the shuffle button and hit print again. 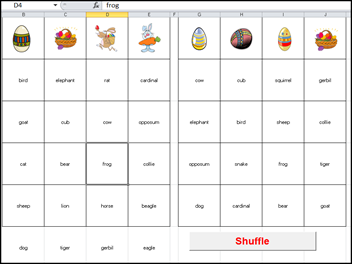 Each time you hit the shuffle button MS Excel creates a two unique bingo cards that you can print out and use. Be sure to read the instructions. These improved bingo card generators have tabs for one card or two cards per page. More than just Halloween! Over 100+ resources. See all of the games and resoruces available from our site and our premium game template and resources web site. It all comes with a book! 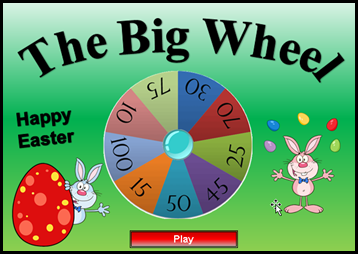 Want to learn more about using digital games like these to enhance teaching and learning? In the book, Everybody Wins: A teachers guide to customizing games for any curriculum , Dr. Jeff Ertzberger takes his knowledge of classrooms and games and shares his strategies for designing games that enhance any curriculum or topic. In addition to the book comes complementary access to Dr. Ertzbergers premium game template web site which contains even more great templates and games for classroom use. The book is available as a digital download, so you can get access to the book and extra templates immediately. Click here to learn more about the book, and premium template web site. .